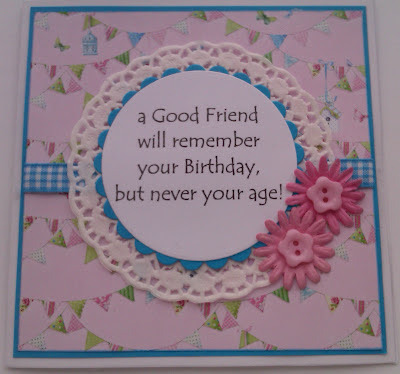 I created the sentiment myself and used Tempus sans font, cut and mounted onto a doily from The Pretty Little Ribbon shop, the paper is Papermania - Lucy Cromwell, flowers from Papermania capsule collection, buttons from dovecraft back to basics and ribbon from stash - hope you like it! Love the sentiment and the card. Fab card - I love the sentiment! the one with the green truck! Spots and Stripes with The Cutie Pies! The one with the "oldie but goodie"